Looking for a crisp, autumnal name for a son? The saintly, literary Crispin might be one to consider. 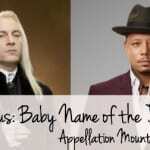 Thanks to Arthur for suggesting our Baby Name of the Day. If not for Shakespeare’s Henry V, this name might have faded into obscurity. The play recounts actual events, including the battle at Agincourt on October 25, 1415. The king had amassed his troops, the English against the French. Despite being badly outnumbered, the English would prevail, and the battle would prove pivotal in the course of the Hundred Years’ War. Odds are good that you recognize that phrase, even if you’ve never read a line of Shakespeare. So who was the saint commemorated on October 25th, and borrowed by the king for his stirring speech? Legend tells us that Crispin and his twin brother, Crispinian, were well-born Roman Christians who fled persecution. They ended up in Gaul, where they worked as shoemakers and spread the gospel. Persecution caught up with them and they were eventually martyred. Historical evidence for their lives is lacking, but they’ve been immortalized by the Bard, and later by Wagner. Because they made shoes for their day job, they’re the patron saints of shoemakers. In Die Meistersinger, the shoemakers enter singing a song of praise to the saint. Early unions of shoemakers also took the saint’s name. Centuries later, a monk by the name from Viterbo, Italy was canonized. He also answered to Crispin. 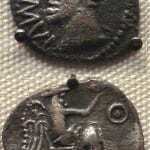 The name traces its origins to Roman family name Crispinus, from the Latin crispus – curly-haired. A handful of notables belonged to the family, including Bruttia Crispina, the wife of Emperor Commodus. Quirky actor Glover. He parents chose his name for the speech. An elf in Terry Brooks’ Shannara series. Writer Avi used the name for the hero of his 2002 medieval adventure novel for young adults, Crispin: Cross of Lead. A very minor character in the Harry Potter ‘verse bears the name. He appears on a Chocolate Frog trading card in the video games. The name has never charted in the US Top 1000, though a few dozen boys receive the name each year. In many ways, the name fits current trends. Chris- names are traditional favorites. Christopher ranked as high as #2 in the 1970s and 80s, and remains a solid, Top 100 favorite. Christian has rnaked in the Top 100 since the 1980s, too. And it’s old news that two-syllable, ends-in-n names for boys make popular picks. Overall, the name sounds historic, literary, and yes, crisp. It feels like a stand-out name, though Cris blends in nicely. If you prefer daring names that few children will share, Crispin might be a choice to consider. What do you think of Crispin? Would you consider this name for a son? This post first appeared on July 23, 2008. Revisions were published on April 27, 2011 and September 22, 2016. I like Crispin a lot. It brings happy memories. When I was a kid, my dad always read a book called Mister Dog to us. The dog was called Crispin’s Crispian because he belonged to himself. It’s been a long time since I heard it but the name sticks with me. I love this name. And I love the idea of Crisp as a nickname. However, despite, it’s masculine lineage, the only Crispin I’ve ever known in real life was a girl. We played soccer together in the 80s and 90s, and she was a fantastic and spunky player. So, the name always sounds either feminine or gender neutral to me. Funny, I feel the same way about Tristan. I discovered it in the 1980s when Kristen was big, so it felt feminine to me. Agreed on Tristan. I can’t get over the meaning, though, so it just sounds more sad than specifically gendered for me. I really love Cripsin’s sound and his connection to Shakespeare, but I do rather wish he had a better meaning — what is it with male names that begin with “c” and describe a physical feature?! Calvin, Claude, Cameron, Campbell, Cecil. . .
Other than Shakespeare, my primary reference for the name is of course Crispin Glover. I find the actor rather fascinating in a somewhat creepy way. My brother went to a presentation of his recently and said that while his poetry was really quite brilliant, that he (my brother) had never felt so offended in his life than when watching the film shown. I like Crispin. In the same book where I fell in love with the name Quinlan, there was a character named Crispin. I liked the character and the sound of it, as well. I still have Crispin on my someday list. And I don’t mind Cris as a nickname, although I wish there was something better out there. The Feast of Crispin just makes me think of a lot of people eating potato chips. I’m sorry, it’s just not my style! I went to a summer church camp called St Crispin’s too (was yours in Oklahoma, katybug?). That’s my first and strongest association with the name (which makes it feel more like a place than an actual name). Crispin Glover doesn’t negatively affect it for me, but I’m still just so-so on it. I dated a Cris in college. That was the name on his birth certificate, although he would at times claim it was short for Crispin. He didn’t leave me with the best impression of the name. My BIL is Christian and his cousin (with the same last name) is Christopher. Too many Chris names in the family tree. Another nn possibility is Chip, although that still relates to potatoes. Love the idea of Chip … except you’re right that it does double the spud reference! Crispin is an okay name, but I’m afraid it would be constantly misheard as “Kristin.” It reminds me of Crispian Mills, the son of actress Hayley Mills who was in the ’90s British band Kula Shaker. Oooh … fun name fact, Virginia! Crispin has been on my list of “British sounding names” that I like for the middle spot. Also probably on my list of “Names that the husband would never agree to”! I would be slightly disappointed to name a son Crispin and then have him just prefer to be known as Cris. I went to a church summer camp called St. Crispin’s for many years growing up. Crispin has great sentimental value for me but I worry about it getting shortened to Crisp or Crispy. A couple years ago I woke up from a dream featuring a boy called Crispin and found myself completely in love with the name. The luster faded somewhat, but I have liked it ever since. Still like Crispin, after all this time. Snazzy, sharp and neat. His history makes him appealing and his current unpopularity adds to that appeal. All in all, Crispin gets a silod :thumbsup: from me! I kind of like Crispin but I like Caspian and Christian better. It is light years better than Christopher which is so dated. It’s nice. I don’t think it’s as ‘silver spooned twitish’ as Digby, Jocasta and Mungo, but it’s getting there. Crispin “Hellion” Glover is an amazing actor. Unnerving at times but very good. I think I’d take him over Helena’s brother who’s portrayal of Mr Bingley p*ssed me off. I like Crispin in theory but I wonder how usable it really is. The unfortunate nickname Crispy seems to be lurking right around the corner. I would love to stop hearing Christian and start hearing Crispin. It’s fresher sounding without being named after a religion, which I personally find a heavy-handed approach to child-naming. Ooh … Balthazar will be NotD on August 7. Great idea! And I agree – Chris and Christopher strike me as such tired, unappealing choices. I have a cousin called Cristofor – the traditional Italian spelling with the final “o” lopped off. He’s just shy of 40, so it seemed like an exotic choice to his parents circa 1960-something. Today it just seems needlessly kreeatif. But Crispin would, I think, wear well on a modern child. And Christopher is a family name on both sides, so I’d even consider Crispin an “inspired by” kind of choice. Let’s see if he gets love from the others. I’m not sure how he’ll be received! I thoroughly like Crispin despite creepy Crispin Glover. “Daddy Day Care” has a Crispin. He’s the nasty one with the mouth, who ends up an angel in the end. My only pause is he shortens to Cris/Chris and I completely dislike the Chris sound on it’s own. If I could talk my other half into it, I’d use him mself. But he can’t get past creepy Crispin Glover. Talk about Celebrity wipeout. […] Crispin – Shakespeare had King Henry V rally his troops with the enduring Band of Brothers speech about Saint Crispin’s Day – a story that has become synonymous with the triumph of the underdogs. […] gems in 1920s birth announcements. 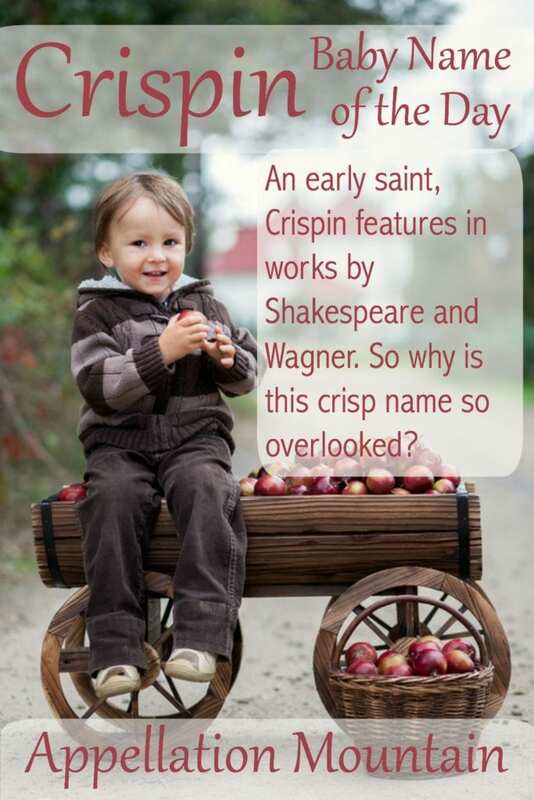 […] Crispin – Little wonder that someone called an apple the Crispin.